With a huge variety of styles how do you find the perfect curling iron for your hair? First you need one that gets hot enough to properly curl your hair – the thicker your hair the hotter it needs to be. Secondly you need one with the correct barrel size for the style you want to create – a smaller barrel will create tighter, bouncier curls; while a larger barrel means bigger curls or a more beachy wave look. Lastly, it needs to be easy to hold and use. You also might hear the term curling wand instead of curling iron. A curling iron has a barrel and a clip to hold your hair, a wand does not have the clamp and usually features a tapered barrel that goes from wider at the base to narrow at the tip. It is easy to burn yourself or damage your hair if you don’t know what you are doing. Therefore, before you use any curling iron we recommend watching some tutorial videos demonstrating how to use it most effectively. Then practice with it before you plug it in and gets hot. Once you are confident in how to handle it, then get to work created those beautiful curls or beachy waves. To determine which one was best we looked at dozens of models including both irons and wands and read reviews from many of the top beauty-related websites and magazines. We compared the top choices and came up with our list of the top 10 best curling irons which we review below. 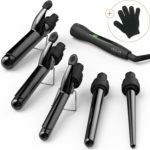 The $129 Beachwaver Co. Beachwaver S1 is a unique self-rotating wand that takes the work out of curling your hair and lets you finish in record time. The S1 has a ceramic 1-inch barrel with a clamp, a temperature range of 290-410 degrees, a fast/slow speed switch, and a home button to reset the clamp at the start position. The one negative is that the Beachwaver S1 takes a bit of practice to get the hang of it, but once you figure out exactly how to use it you will save time. It is also the most expensive curling iron on our list. For many people this is now their go-to curling iron to create loose beachy waves or more defined tight curls. A very close second is the Sultra Bombshell Rod Curling Iron which sells for about $85 (although we have seen some extreme price fluctuations up to $130). It scores positive reviews from almost everyone across numerous beauty and review sites with many people saying it works wonders and reduces styling time. It beats the competition because of quick heat-up and recovery and maintains an even and consistent 380 degrees with its ceramic construction. It is available in 3 sizes – 3/4 inch, 1 inch, and 1.5 inch – and comes with a heat glove which should be used at all times since there is no clip on this model. As for negatives, it is obviously more expensive then many other options so if that is a concern then look for another choice that is cheaper. It also does not have a temperature adjustment which gives you less control and adjustability. The Remington CI9538 is the best-selling curling iron on Amazon thanks to its affordable price of $25 and perfect dent-free curls. Most user reviews of the Remington CI9538 are very positive with an average of 4.3 stars on Amazon for about 6000 reviews. The rod is a 1 to 1.5 inch tapered wand without a clamp so you don’t get dents or bends in your hair. This Remington T|Studio model also has a ceramic pearl technology for the smoothest finish. The temperature ranges from 270 – 410 degrees which will heat up in under 30 seconds and it has an auto shutoff. Overall we highly recommend this Remington curling wand for anyone who wants a quality cheap curling wand. Buyers should note that this version creates bigger, looser curls, but there is also a 1/2 to 1 inch model that can create tighter curls. 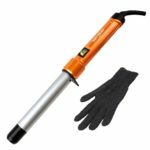 If you are looking for a cheap curling iron with a clamp then we recommend the Hot Tools Professional Spring Curling Iron available for about $30 depending on the size. It scored one of the highest ratings of all models from users on TotalBeauty.com and most reviewers agree that this thing heats up fast, gets very hot, does not pull hair, and works great. Model 1110 is 1.25 inches, but there are 8 sizes from 3/8 inch up to 2 inches. This clip model also has a smooth gold-plated barrel, 10 adjustable heat settings up to 428 degrees, and 8 foot cord. A few people have complained about the construction quality and some do seem to fail prematurely, but that is not completely unexpected at this price. Users should also be careful of high temperatures and start off on a low heat setting. Some people have burned chunks of their hair off because it was too hot. 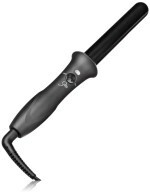 Our pick for the best curling wand under $20 is the Bed Head Curlipops BH313 1″ Curling Wand which sells for $19.97. This clipless tourmaline ceramic wand receives one of the highest ratings for any model on Amazon with a 4.4 star average with almost 700 reviews. It has a 1-inch barrel designed for loose waves and curls. In addition to the BH313 there are also 4 other units in the Bead Head Curlipops lineup each designed to get different results from springy spirals to waves galore. The BH313 has only one heat setting of 400 degrees F. While this works for most women, it may be too hot or too cold for certain hair types. One model that has been getting a lot of love on Amazon recently is the Kiss Products Instawave Automatic Hair Curler which sells for around $35. The Instawave has a 1″ ceramic infused barrel and a clipless spinner that has hooks which wrap your hair around the barrel as it automatically rotates left or right at the press of a button. This makes creating curls super easy and saves time on both long and short hair. This Kiss Products curler has two heat settings with the max being 420 degrees. It also contains an automatic shutoff. It does take some time to get the hang of using the Instawave Automatic Hair Curler, but almost all users say it is easy to use after a bit of experimenting and does not tangle your hair. The $37 xtava Satin Wave 5-in-1 Curling Iron and Wand Set provides a great value since you get 5 different styling tools in one set for an affordable price. This is the best-selling set on Amazon and users really like it since it scored a 4.4 star average. The set is comprised of two tapered clipless barrels (1 0.3″-.75″ and 1 0.7″-1″) and three barrels with clips (0.7″-1″, 1″, and 1″-1.25″). However, none of them have a cool tip. There is nine heat settings between 250 and 410 degrees. Overall the xtava Satin Wave 5-in-1 Curling Iron and Wand Set is a great option since it can create any type of curl you desire, but the lack of a cool tip on the clip barrels is a turnoff. It also might not be perfect for you if you need a really hot iron since this unit has a bit of trouble staying hot and recovering heat while you are using it. 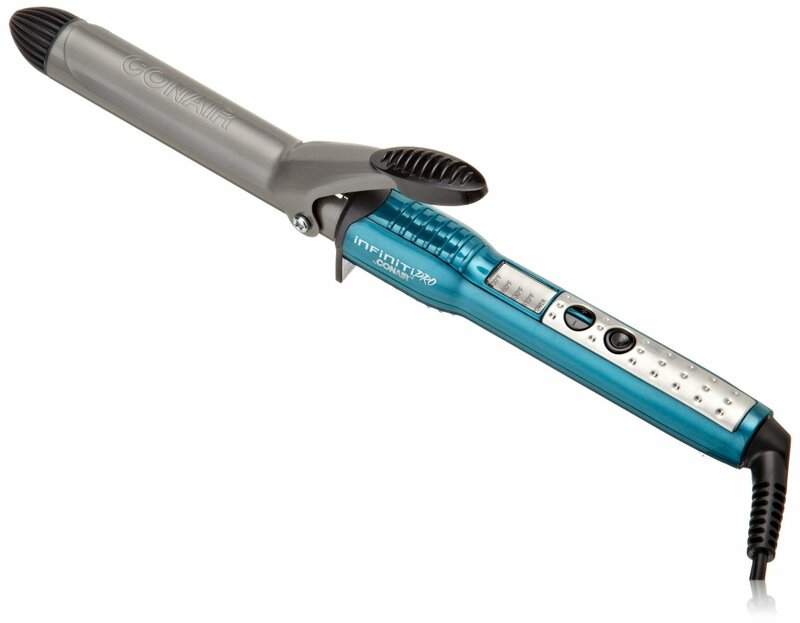 If you are looking for a hot curling wand then the BaByliss BABNT125TB Pro Nano Titanium ConiCurl Iron might be for you. This $45 wand has a 1.25 inch to 3/4 inch tapered barrel, but there are other sizes available too. It provides fast heat and recovery up to 450 degrees thanks to the nano titanium barrel. You can use the larger end to make larger curls and waves or the smaller far end to make tighter curls. It does not come with a heat glove, so you will need to purchase one if you don’t want to burn yourself. 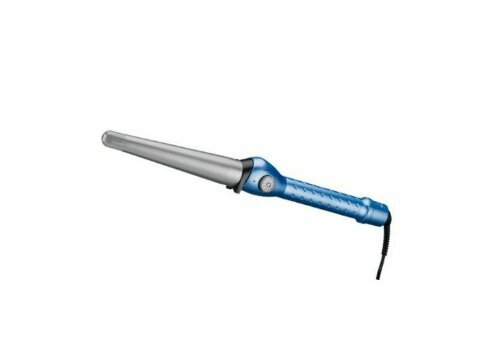 If you are looking for a Marcel style iron then look no further than the Hot Tools Professional Marcel Curling Iron available for about $32. For those of you who don’t know, a marcel curling iron has a lever design with a locking/unlocking device instead of a spring-loaded clamp. They can be tricky to use by yourself and are more recommended for professional stylists. This model is available in 5 sizes including 3/8″, 1/2″, 1″, 1.25″, and 1.5″ and has variable heat settings up to 430 degrees. Overall this Hot Tools Marcel Iron is a solid performer with an affordable price tag. If you are looking for a cheap curling iron that still gets the job done then you might be interested in the Conair Infiniti Pro Professional Nano Tourmaline Ceramic Curling Iron which sells for about $17 depending on the size which comes in 1/2 inch, 3/4 inch, 1 inch, 1 1/4 inch, and 1 1/2 inch. 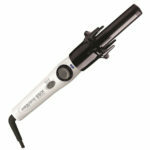 It has a smooth tourmaline ceramic surface and 5 heat settings that give you curls without the frizz. Does this thing work as well as the more expensive models? Not quite, but it still is pretty decent for this price. One other main complaint from users is the on/off switch is in a place where you accidentally hit it while you are using it.